The Wall Street Journal is reporting that the Consumer Product Safety Commission voted on Wednesday to move toward tougher safety standards for table saws. This comes as bad news for the Power Tool Institute and its members who believe the safety standards they adopted in 2007 are adequate when used properly; many of us actual tool users would agree. The problem is, the CPSC has been lobbied pretty heavily by inventor Stephen Gass, who wants every table saw in the US to use his safety invention which can stop a table saw blade as soon as any flesh makes contact with it. The technology Gass invented is pretty awesome, and he uses it in his SawStop brand of table saws successfully, but it is not cheap. I am sure the CPSC has our best interest at heart, but at what cost? A good jobsite table saw already cost $500 or more, so the question is, how much will the SawStop technology add to the price? The cheapest SawStop saw, their contractor model, costs around $1500. This could also be the end of the smaller Portable Jobsite Table Saws. The CPSC has stated that their vote does not necessarily mean they will mandate the use of the SawStop tech, but it does mean that changes will be coming. My question is, what more can table saw manufacturers do to make their saws safer without using Gass' invention? It seems to me that just about all of the safety features that we know of are already on the newer table saws. If forced, PTI members will likely choose to use the WhirlWind safety method (which I wrote about here) over SawStop, because it would be easier to implement, would cost less, and would add less overall weight to the tools. Either way, we are looking at more expensive tables saws in our future. Take a look at the videos after the break to see both the SawStop and the WhirlWind systems in action. SawStop table saws exclusively feature the SawStop Safety System which stops the blade within 5 milliseconds of contact with skin. SawStop saws prevent serious injury and give operators peace of mind. 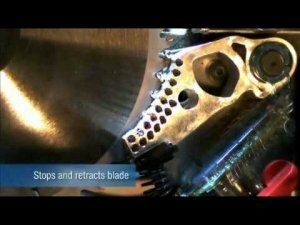 Patent-pending Whirlwind™ table saw emergency blade brake is a simple device which can be easily and inexpensively incorporated into production or retrofitted to millions of existing saws. The Whirlwind differs from all previous table saw blade guards, with a built-in "electronic fence." A proximity detector immediately shuts down the saw motor and stop the blade, without damage, in one-eighth of a second — before the operator can contact the spinning blade. The saw can be restarted almost immediately. Patent pending table saw safety systems developed for the bench top Makita and Delta, Rigid, Powermatic models include integrated saw dust removal. Available for assignment or license from www.whirlwindtool.com.